Low customization, no possibility of self improvement – only professionals can adjust. No need to adjust, what you get is what works, if something stops working, get a new one. Highly customizing – everyone can improve, community based. Exploitation based on ideology of style. 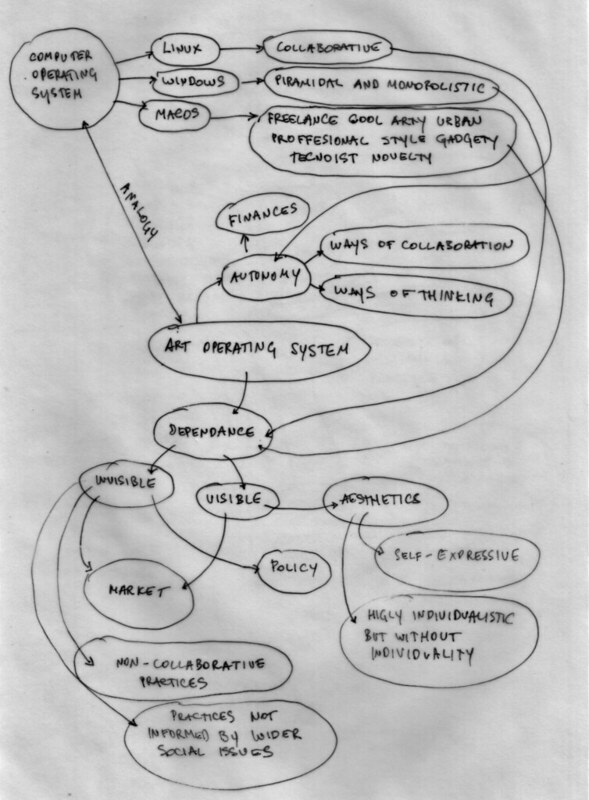 Sharing work flow, gift economy, high precarious element. Depending on huge advertising machine, monopolistic and unsustainable. Depends highly on amount of people using it – small amount of professionals make it sustainable. Sustainable on many levels: adoptable, recyclable, high level of customization and localization. Large amounts of e-waste created by advertising stronger, newer and better equipment cyclically. Old equipment is not recycled. Smaller amount of waste due to longer life span. Motto is “futurists don’t look back”, so there is no recycling involved. Opens up awareness and according actions to possibilities of recycling and reusing: software for older machines, less resources needed. Profit based art system concerned with traditional gallery/museum model with pseudo-development. Elitist, aesthetics regarded as “something beautiful” system, where highly professional independent actors run art system based on novelty. Always changing, concerned with medium as much as with message, sustainable, localized, exchange makes it work, collaborative, always work in progress. Diagram shows art operating system with working in autonomy and dependant one in reference to computer operating systems.